Photo courtesy of Indiana State Sycamores' Athletics. The home dominance of Indiana State continued Wednesday night as the Sycamores utilized a better second half to win their seventh straight in the Hulman Center. TERRE HAUTE, INDIANA---"Boring, boring, boring!" In a crucial Wednesday night contest at the Hulman Center, both the Indiana State Sycamores and Missouri State Bears played as though neither wanted to win the game. No, really! Combining for an overall shooting percentage of 34.4% (Missouri State 32.3% and Indiana State 36.5%), the two wallowed under the half century mark for the majority before the Sycamores finally saw shots fall and pulled away to a 68-59 victory. Neither accurate early, only ten points were scored in the first five minutes before the Bears trudged ahead to a 10-4 edge with four straight points from freshman Robin Thompson. Even though Brenton Scott finally got open while being guarded via a "box and one" and netted half of his ten points in a 70-second segment, ultimately pulling the Trees within three (12-9 MSU), Missouri State quickly recovered and rolled off 11 straight points, 6 of which came from "jazzy junior" and leading scorer Dequon Miller, to blast ahead to what would be their largest lead of the entire 40 minutes (23-11 MSU). What was wrong with the Sycamores? This was not the same team that dominated a Missouri Valley Conference contender in Evansville! However, Greg Lansing's bunch did flash a glimpse of their old selves with an 8-0 spurt to wither the deficit to 4, which is where it stayed heading into the halftime locker room (31-27 MSU). After a horrific first twenty minutes, the Indiana State Sycamores knew they needed a much improved half to leave victorious. Fortunately for them, they did just enough to come out on top. Once again, both Indiana State and Missouri State started the half ice cold from the floor as ten points were totaled before the first media timeout. But, seven were property of the Sycamores, meaning we had a tie at 34. Back and forth the teams traded baskets for the next eight minutes until the terrific backcourt trio of Indiana State (Devonte Brown, Brenton Scott, and Khristian Smith) produced seven consecutive to steal a 5-point lead. Although the Bears' Dorian Williams was able to get fouled and make two free throws to end the scoreless stretch, the frontcourt of the Sycamores made an appearance through Emondre Rickman, who caused havoc in the paint with four points, and Matt Van Scyoc nailing a triple. 54-46 Indiana State! With just five minutes remaining, Missouri State had a great deal of work to do for a comeback. Yet, less than 90 seconds later they had already shaved half of their opponent's advantage. Unfortunately though, making only two attempts for the remainder of the contest, Paul Lusk's group was unable to pull any closer while the Sycamores tacked on free throws to win by nine. "I definitely take pride (in being a 1,000 point scorer). Now I am in the record books, who would have thought I would be in the record books as far as scoring some points. But now I am just trying to catch K-Smith." While Indiana State Sycamores "star senior" Devonte Brown would have probably preferred to net his 1,000 point in a better team performance, he was more than happy to surpass the total with 15 points on Wednesday. The 6'2" guard salvaged a poor shooting performance (3-of-11) with 9 makes at the charity stripe. 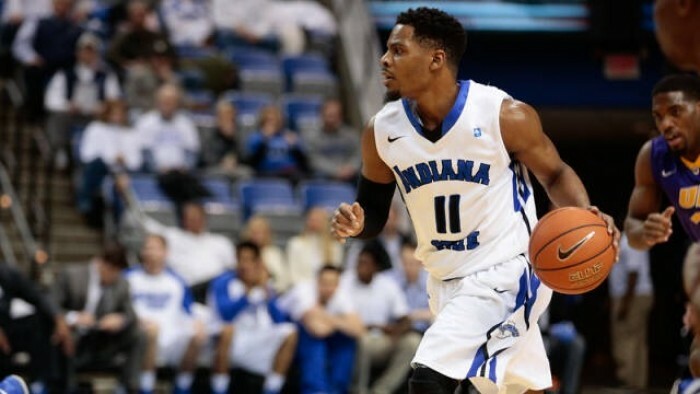 Brown has been instrumental in the success of Indiana State as he has led the team in scoring each of the past two seasons while supplying veteran leadership. Uncharacteristically held under ten points in his last five games, Khristian Smith was the difference on Wednesday night. Despite starting off slow with six points on 1-of-5 shooting in the first half, the very talented wing finally found his groove by keeping Indiana State close with clutch baskets. In fact, by providing 7 straight Sycamores' points, Smith increased a four-point edge to nine with just over two minutes remaining. But that's not all! In addition to his game-high 20 points, he grabbed eight defensive rebounds and facilitated four assists. 12-9 (6-3) Indiana State will put their two-game winning streak on the line when traveling north to Chicago for a meeting with Loyola (IL). Let's put aside Bradley's freshmen and Wichita State's "fab freshman" Markis McDuffie for a moment. Who is the best in "The Valley?" How about Missouri State's Jarred Dixon? Dixon, a true freshman from Kansas City, Missouri, entered Wednesday night playing some of his best basketball, for he posted double-digit point totals in his last two contests (12 & 10). And tonight, he stole the show. With Indiana State's defense keying on Dequon Miller because of the team's second and third highest scorers Camyn Boone and Chris Kendrix not on the floor, the 6'2" guard stepped up with a career-night of 19 points and 4 rebounds. From hitting jumpers to driving the lane, the 6'2" guard constantly frustrated his opponent through athleticism. Furthermore, he was able to get to the free throw line, where he made 7-of-9 attempts. Defeated by nine, the Missouri State Bears shot eight more free throws than Indiana State this evening (31). BUT, they made one less (18). Possessing the second worst free throw shooting percentage in the Missouri Valley Conference, everyone figured the Bears would struggle. Though, not to the extent that they did. Finishing with only 59.1% of their shots from the charity stripe falling through the cylinder, Missouri State did not deserve to win this ballgame considering the amount of free points squandered. 8-13 (4-5) Missouri State will attempt to get back on the winning trail Saturday upon hosting red-hot Illinois State. "It wasn't a very pretty game, and I would think Greg (Lansing) would say the same thing." ---Missouri State Bears' head coach Paul Lusk. "He (Camyn Boone) tried the other day but just couldn't go. We're caught in a real tough situation there because he needs a lot of time off. But, I don't know if we got time." ---Paul Lusk on how close his best post player Camyn Boone was to playing against Indiana State. "Chris Kendrix is a part of this team, and as coaches and players as an entire program, we're going to continue to support him on the highest level as he works through some things he needs to work through." ---Paul Lusk on the status of Chris Kendrix going forward. "I was very impressed watching him. He's a little guy, but he plays with some toughness and some grit. He goes in there--and I have seen him make a lot of those--but he was 4-of-18 and 0 for 4 from three. We thought he was a good three-point shooter and he is, so we were fortunate a lot. I thought he got deep on us a lot of times, where the ball didn't drop for him. But the kid is a good player and he is a difference maker for them." ---Indiana State Sycamores' head coach Greg Lansing on Missouri State Bears' star Dequon Miller. "I mean, it's fair game when the ball is in the air" said Indiana State Sycamores' guard Everett Clemons on his tenacity for rebounds. "If it is a loose ball, I am going to get it. If it is in the air, I am going to get it. Just trying to do whatever I can do to get us the win." The transfer from Vincennes University, who pulled down 11 rebounds, has been a deadly weapon on the offensive and defensive boards as he is averaging a team-high 6.6 rebounds per game and 11.3 in his last three games, including Wednesday.